An article in our last month’s issue brought memories flooding back for Fleetwood man Frank Bee. In her feature on the town’s Victoria Street, historian Bill Curtis wrote about the buildings in and around this old part of Fleetwood. Mr Bee, or Dronsfield Road, was born in Victoria Street and spent many of his childhood years in the area. Brought up by his widowed mother – his father died when he was three – Mr Bee remembers many of the families who lived in Victoria Street. “We lived there in the 1920s and 1930s. I was the eldest of four boys (one young brother later died when he fell in the boating lake and another died in a drowning tragedy in the River Wyre in 1975),” he explained. The family lived in the section between the market and North Albert Street. “Neighbours included police sergeant Hart, Miss Dunderdale, the Hayes family, my grandad and grandma Holden, a couple called Smith and an old couple who made excellent ice cream and sold it to the local children. “Then there was Nellie Jackson who had a sweet shop – she was sister-in-law to Bert Jackson who was a contender for the British featherweight boxing title. “Across the road between Aughton Street and Custom House Lane lived Bert Jackson’s parents, a lady called Nellie Bolton – who knew all the local gossip – and granny Eaves who used to sit on a stool at her front door. “Two Robinson families lived in Victoria Street – one near Albert Fould’s Dome of Discovery. 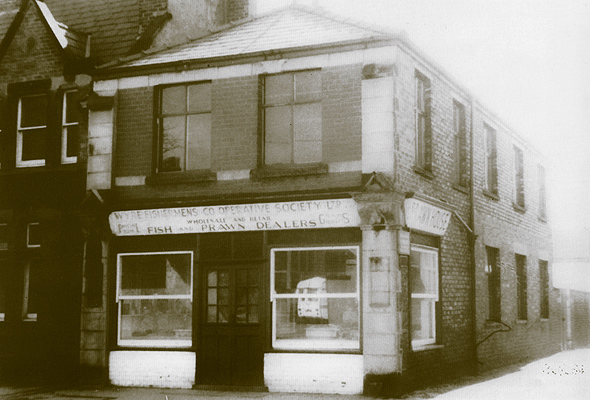 “There was a shop occupied by the Picken family. Mr Picken had a lathe in his cellar and made rollers for mangles. “Being the eldest lad, I remember I had to turn our washing mangle at home before I could go out to play. I suppose it was only about 10 minutes but to me it seemed an eternity,” he said. “In the street was also a family called Houston – Billy Houston was bowman on the lifeboat. “There was a lady called Emmie Stoney and the Smith family. “The Burns family moved in and started a bakery business. “A cake shop – on the corner of Custom House Lane – was run by the Jackson family. “Of course there was the prawn house – in full production in those days – with 4 of my aunties and my mother working there. Mr Bee said he used to go to the prawn house with a “bass” to collect shrimps for picking at home. “We had to pick for an hour before we went to school and again before we went out to play at tea-time. “If we were caught eating one there was trouble. My grandma sat at the head of the table surrounded by the rest of the family. It was our only source of income – apart from 21 shillings a week from mother’s widow’s pension which she received after dad died in 1928. He had served in the First World War, been taken prisoner and I don’t think he recovered from that,” added Mr Bee. “Our rent was 21 shillings and when mother asked our landlady to reduce it by one shilling she refused. “But I can picture my grandma now – she kept an old-fashioned wooden hairbrush at her right hand. “Anyone pinching a prawn got a rap across the knuckles,” said Mr Bee and admitted he often suffered from rapped knuckles. “I also remember taking picked prawns back to the prawn house where of course you had to weigh them in. I was carrying them in a big enamel bowl covered with a towel and I sneaked a few prawns before I got there. “When I got home and told my mother the weigh-in figure she smacked me across the face – she knew it was short measure! “Sometimes I thought she must have counted the prawns we picked!” added Mr Bee who said there were quite a few families in the area supplementing their income by prawn picking. “Most of us lads also worked on the nearby market. “I worked for a farmer called Tom Shorrocks from Wesham – just helping loading and unloading his van. “He paid in kind – eggs or bits of chicken, potatoes or vegetables. But worth a lot to us. “It was a close knit community – everyone was friends with everyone else. You could leave your front door open and neighbours used to pop in and out,” recalled Mr Bee. One memory of Victoria Street is of girls singing all day long in the prawn house. “We used to help push the cart up and over the railway bridge at the top of Adelaide Street to get the prawns off the boats. “We carried the baskets to the carts and pushed them back to the prawn house for a feed of ‘throw-outs’,” he added. When Shirleys’ Cycles opened two of the Bee brothers – Ben and Ken – were among the first customers. Another family in the “Street” were the Robbins. “There was a son Bill and daughter Edith. “I remember Bill was a good boxer and took part in many fights in the market hall when it was used regularly for boxing. “Yes your article last month certainly stirred memories for my brother Ben and myself,” said Mr Bee. The family came from Hambleton – great great grandfather Bee moving to Fleetwood in the 1809s with 21 children! They moved into Aughton Street and an alleyway nearby for the nickname “Bee’s Back”. “They were hard days – but on reflection happy days,” said Mr Bee. First published in Life in Fleetwood issue 15, December 1991. Lovely to read this…..sadly Frank Bee died in July this year aged 88. My great Auntie Marg has lived on Victoria Street for most of her life. She’s in her eighties now and owned hairdressers called “Margaret’s” ever since I can remember and I’m 50 now. She’s been retired for a couple of years but still lives there. Anyone remember her?